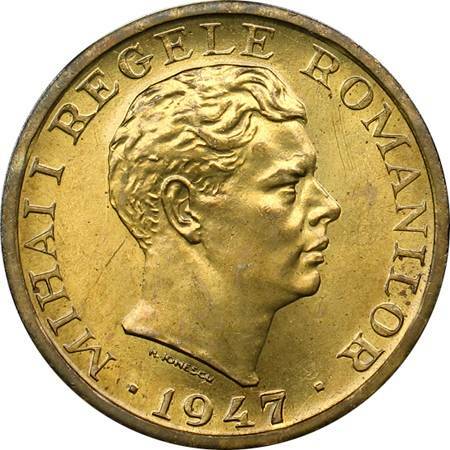 denomination "10.000 LEI", ROMANIA, olive branches and Romanian coat of arms the inscription "MIHAI I REGELE ROMANILOR" meaning "KING OF THE ROMANIANS", MIHAI I head facing right and year 1947 between two square signs. Under the neck lies H. IONESCU, the engraver's name. 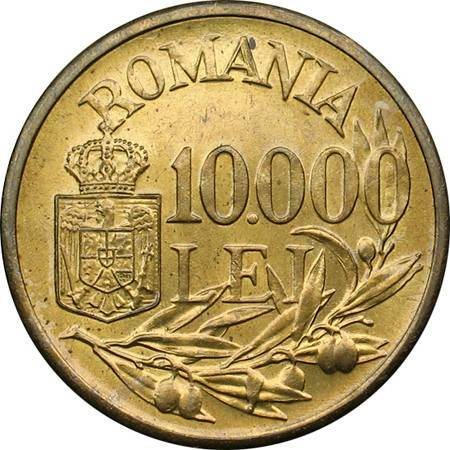 According to the information from the book Monetele României (Iliescu and Radovici, 2004), the 10.000 lei 1947 coins were struck in 6.000.000 pieces. The inscription on the edge can take various positions respective to the faces of the coin. It can start from anywhere and can be laid on the obverse or on the reverse. This observation is true for all the incuse inscriptions or ornaments on the edge of the Romanian coins from the beginnings up to present (2010). In the image above are pictured the marks that separate the words NIHIL, SINE and DEO. The same separating signs as for 100 lei 1943 and 1944 coins were used.